The strategy consists of a short position in stock and simultaneously a short position in OTM, ATM or ITM put options. 1. When we expect the price of the underline security to remain stable or decline, but not below a certain price level. Just like the covered call it is an income generating strategy when we have already opened a short position in stock. In that case we sell OTM puts and we are expecting to expire worthless or we can buy them back at a lower price before expiration. 2. When we want to protect the short stock position from a mild upward move. Here we can write ATM or ITM puts in order to capture more premium and a higher Delta. Our goal is to compensate the loss from the short stock position by the profits of the written puts, because as the price is rising puts are losing value and we can buy them back at a lower price before expiration or leave them to expire worthless. Suppose that we have a short position in 200 stocks at $30 and we believe that in the next month it will go down, but not below $25. In this case we can write 2 puts with strike price $25 and expiration after 1 month. If the stock price remains stable or declines but not below $25, then we will keep the whole premium we received, as profit. In case that the stock drops much more than our expectations, i.e. to $20, then the put will be exercised against us and we will be obliged to buy stock at $25 when its market price at the moment is only $20. The good news is that we have already sold short the stock at $30 so we will buy it at $25 for a turnover of $5/share plus the premium we received. In that way we can generate income by exploiting an already existing short position without having the risk of a big loss from the exercise of the written puts against us, hence the name covered put. Of course if the stock price rises then we have unlimited risk due to our short stock position (look at the INHX example in the page ”what is leverage”, for a better realization of the risk). Maximum loss: Unlimited due to the short stock position – premium received + commissions. Maximum profit: (Price at which we sold short the stock – put strike price) + premium received – commissions. Below we can see the profit/loss diagram for the covered put strategy. 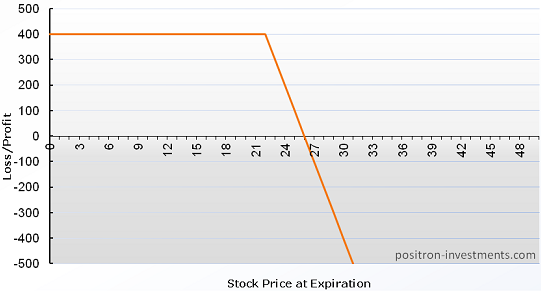 We assume that the stock has been sold short at $25 and the put has strike price $22 and premium $1. In the daily chart of RIMM (down), price is visiting a resistance (line 1) for the first time (point A), after a recent gap down. At the same period the market (SPY) is moving sideways and the implied volatility of the stock options is relatively high due to the sadden gap. This means that the options premium is high which is good if we want to write them. 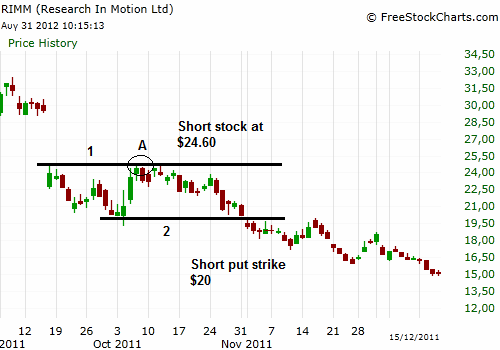 By using the reversal strategy we are opening a short position in the stock at $24.60. We also noticed that at about $20 a strong support is present (line 2) and we believe that the price will not decline below this level for the next two weeks. How can we exploit our expectation given the fact that we are already short in the stock and we don’t risk much by the exercise of a put against us? We can write puts with strike $20 and expiration after two weeks. If we are right, at the end of this time period we will have profited from the stock price decline and as long as it hasn’t breached the $20 level, the puts will expire worthless and we will gain the whole premium. In this way we are generating additional income.